Bi-Stormer contemporary, PFM Team Special 79 60". A great model from the late Pat French. 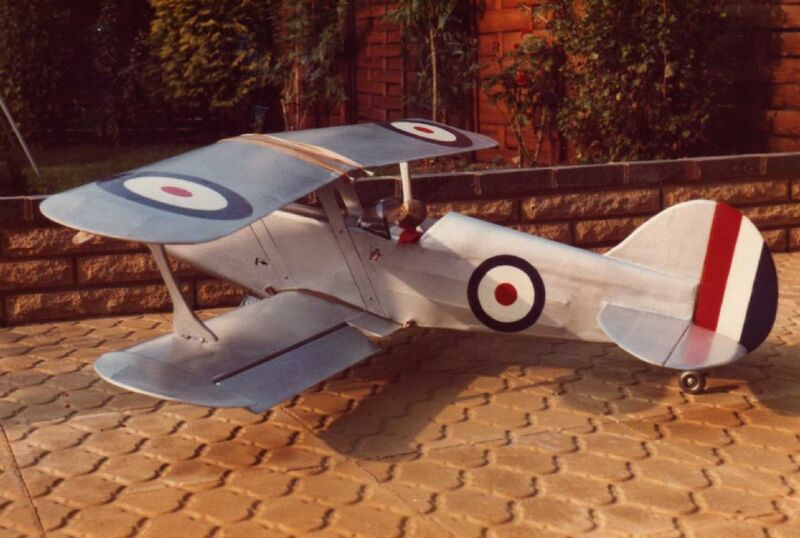 Purely out of interest, I built and flew this when the Bi-Stormer was very popular. At the time I preferred it, although I like the Bi-Stormer a lot and might do one. It was similarly easy and safe to fly, but perhaps a bit more all round capable. 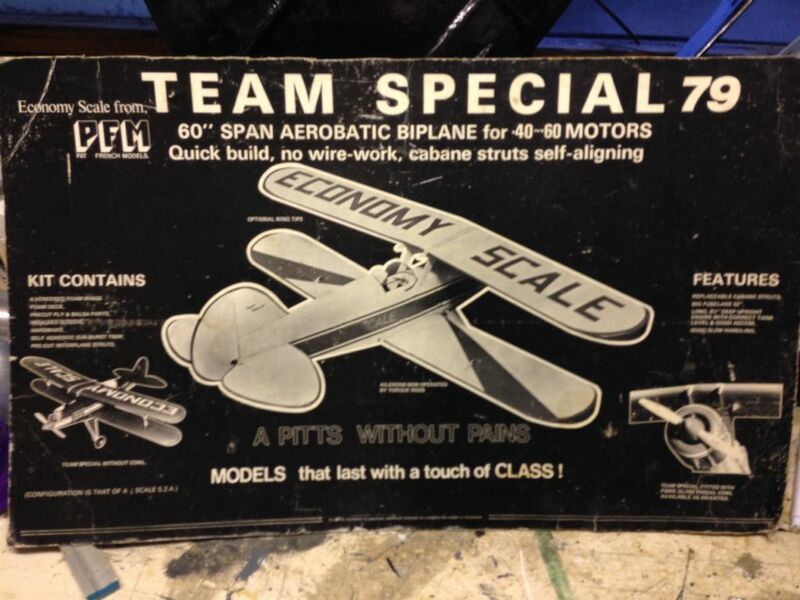 Pat French produced this as a "Pitts without pains" and it was in effect scale Pitts Special wing and tail profiles on a simplified fuselage, very easy to build with foam wings and mine weighed 7 lbs. with an HB 61. 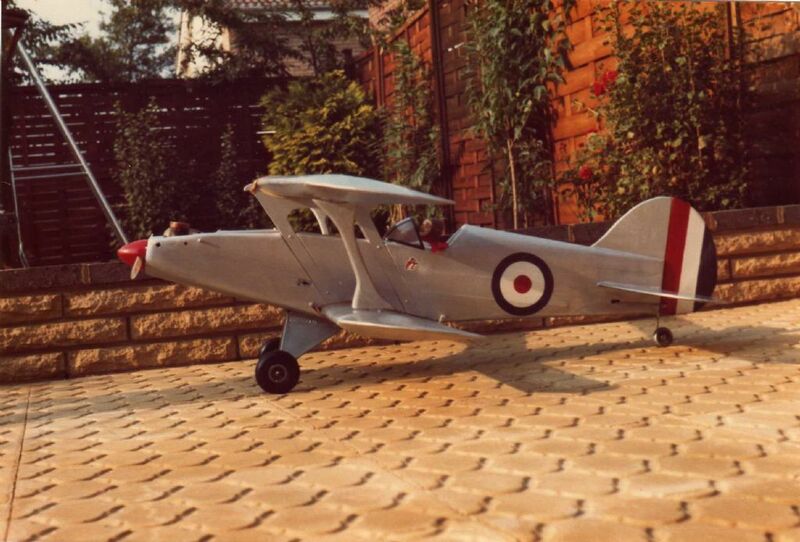 I flew it for years, originally in white and blue Solarfilm with "sunburst" trim on the wings, then in 1983 I stripped it down, re-covered it in nylon and painted it in this "Hawker Fury" style. 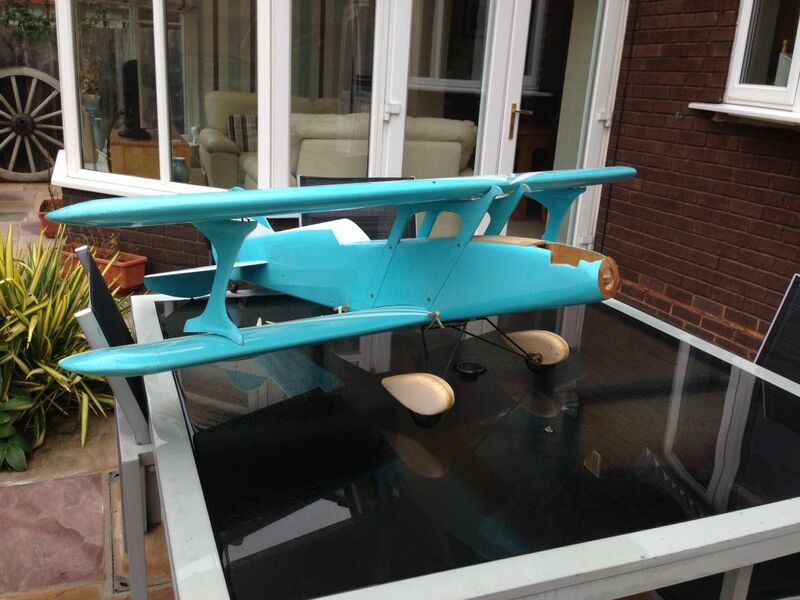 Later I fitted it with an Irvine Q72 and flew it until I had an incident with a fence at Fradley and wrecked it. A while back Andrew McKay enquired on this forum about the Team Special 79 and I was able to send him these pictures and also a photo of the box lid, which I still have. Andrew sent me a copy of the plan, which I had previously lent and never got back, so I could make another one if I wanted to. I have tried to contact him recently, but he seems to have disappeared. Later I will take another picture of the lid and put it on this thread if anyone is interested, it's got a lot of information on it and is fascinating to look at 34 years after I bought it. Like most of Pat French's models, it's worth resurrecting. 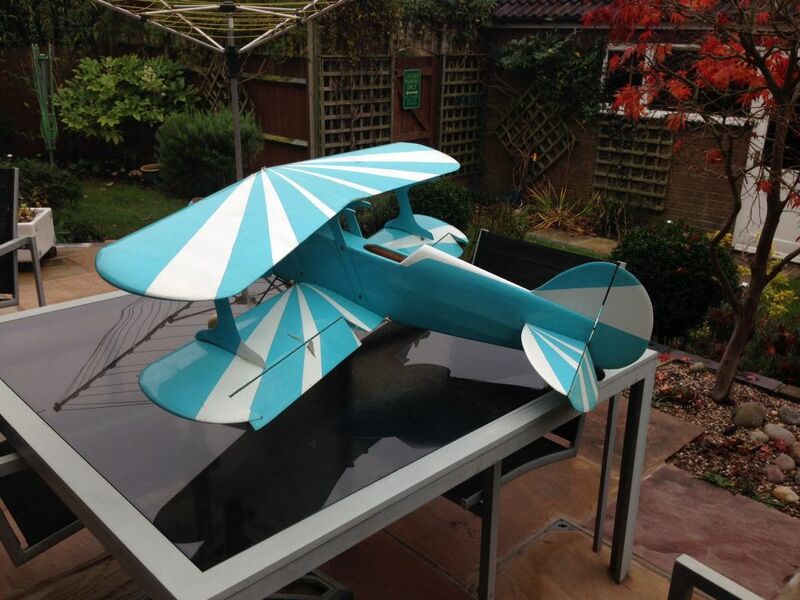 I have also got my Giant Zlin, damaged but repairable and a brand new kit for another one, still in the box that I found on Ebay a while ago. I was a youngster in the late 70's and early 80's and over the last couple of years I've rekindled a love for some of the older British kits. There was a tremendous variety wasn't there? Mag adverts for most kits were in black and white and not the most flattering to some models. Your bipe looks lovely Colin! 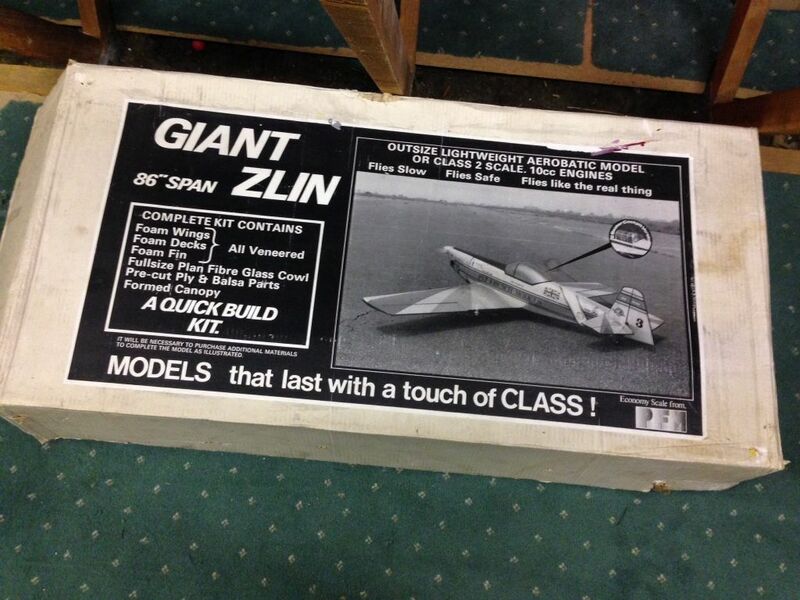 Hi Alan, I was lucky in finding a Giant Zlin a couple of years ago, but I've never seen a Team Special sadly. I've got enough info to make another one though. Here's the Team Special box lid and the Ginat Zlin kit in the original box. I've also got the lid from the GZ kit box I bought about 1980. Although we've had amazing technical advances since then, I don't think the planes actually fly any better. I can't deny though that some of the models we take for granted now were impossible not so many years ago. Amazing coinky-dinky Colin! 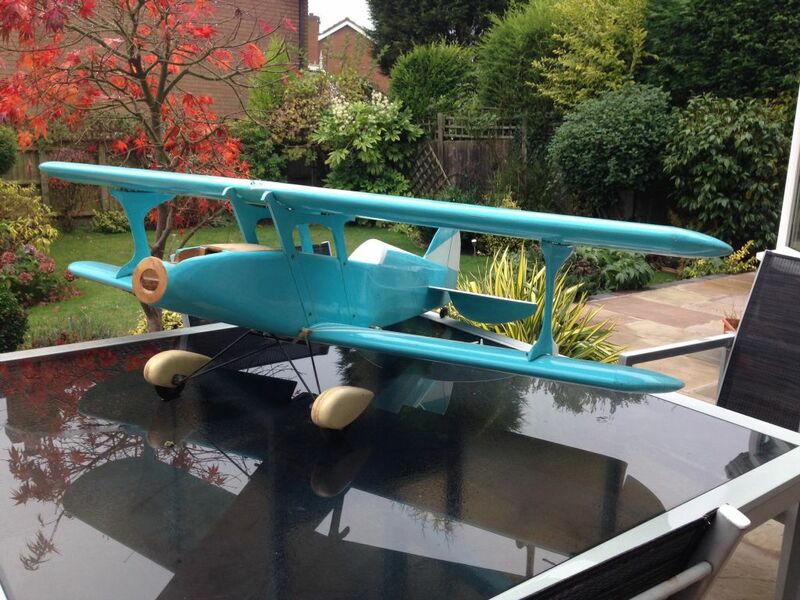 There's a Giant Zlin on BMFA classifieds. It's a bit pricey but I'm wavering. My thoughts are it would suit a 1.20 four stroke converted to petrol. The one I flew had an old Webra 90 in and was OK. I agree with you on the flying abilities. I've got a Gnatty and a Lo-Boy at the moment and you would probably call them heavy compared with a modern built up ARTF equivalent, but they fly great as sports models, especially in the windy winter. My Lo-Boy also does duty on floats because it's tough and can survive a wetting and being carried in and out of the water. I think the biggest difference now is the durability of the modern stuff. Older kits would take an incredible amount of vibration, fuel soakage, whacking into the ground etc before they needed any repair or refurb! Are we going to see a build thread of the Team Special then? It's probably worth going for the Zlin Alan, even if it's a bit pricey it's the kind of model that will last for years with a bit of luck, exactly as you suggest. I flew the Zlin with a Webra 91 as well, after a short unsuccessful attempt with a geared Webra 61 (do you remember that)? which turned an 18x6 prop and flew it fine, but with a huge amount of gear noise which was too loud for our site! It flew beautifully with the 91 and I've no doubt it would be excellent with a 120 petrol two stroke or a four stroke. When I do mine I will do one of those two options, I think. Having said that, they were aerobatic on a 60 and I saw one in Sutton Park flying reasonably on a 40! I've got a number of projects running right now and I was wondering if I might have enough time afterwards to do a Bi-Stormer in time for Greenacres, to add to the Pushy Cat I'm finishing off now. The problem is that I can't forget that when I bought the Team Special from Jim Davies in 1979 it was in preference to the DB Bi-Stormer, which I had considered. The Team Special will build quicker, particularly if I can get some foam wings knocked up and I thought it was a better flyer back in the day. If I do go that way, I'll put it on here, but it's a few weeks off. I finally found myself another Pat French (PFM Models) Team Special. This was the model that I loved the most, a fantastic durable flyer that lasted for about 20 years until I finally tried to fly it through a fence. Collected this morning from a great chap who was a kindred spirit, also having 4 motorbikes in his garage. This one is earlier than mine, perhaps 1978. My 79 version had torque rod operated ailerons instead of the cable type that this one has, otherwise its' identical. I've now got this and the Giant Zlin. With all of the on-going projects, this might seem daft, but I intend to enter into almost complete retirement at the end of March 2015 and then just get on with things. I'm really thrilled with this. As I mentioned before, when I bought mine from Jim Davies in 1979 it was a toss-up between this and the DB Barnstormer. Much as I love the Barnstormer, this for me is the better plane. It's just as doclile but used to do the book with an HB61. With an Irvine Q72 later it was really over the top. Oh Happy Days. Good stuff! I almost went for the Zlin way back when, but chose the Cranfield A1 instead. The PFM jobs were good kits too. It's a shame Mr French packed in doing them, although I understand it was for health reasons. Percy, no, he decided to pursue his other lifelong interest in life, which was motorbikes. He sold the PFM business I think to Stagg Models in Northampton, who never appear to have done anything with it, sadly. Pat purchased the Metisse motorcycle business from the Rickman bros. and set up in Bristol as a specialist motorcycle frame manufacturer. He became well known with an excellent reputation. Sadly he died a few years ago, I've heard the suggestion that it might have been a long-standing asbestos issue or something like that. I might be wrong. A sad loss and his excellent designs deserve to see the light of day again. Although this Team Special must have been built about 35 years ago, it's never flown. It is well built and apart from some wrinkling of the Solarfilm is in perfect nick. What a find. A 70/91 four stroke for this, or perhaps a first venture into petrol, 91 size? Still looking in Colin...I used to fly a Barnstormer 63" for many years and comparing the aerobatic abilities of the Team Special with a Bi-Stormer there would be no contest. I did purchase the unstarted kit of the PFM Giant Zlin we chatted about up-thread, but can't decide how to power it. Ideally I want a petrol four stroke I think. Since then I've got some other 1980's classics in the form of 5 old Sport 40 pylon racers (Midget Mustang, Polecat, Little Toni and Top Turkey) to keep me going in refurb projects. Keep us posted getting this model back in the air won't you? Nothing like a bit of nostalgia. Wonderful stuff Alan, these planes are all great flyers. I'll keep this thread going, although as I said this has to be a 2015 project. Those were the days John! These are proper planes we are talking about, eh what? Like eating porage and rubbing Vic on your chest. I didn't like to mention it in my previous post, but I'm sure I read Mr French was advised to refrain from inhaling any further balsa dust as it was having an adverse effect on his (then) health. I am pretty sure Percy is right about Pat French having to give up working with balsa. And certainly it's something we should all consider when sanding any wood. Best done outdoors and with a mask. My memory says PFM models went to to CB Models at Harlow at one stage as well as Stagg models. Althought his thread is all about the PFM Team Special it's worth saying that although PFM kits are not available now that the BiStormer is still available from DB Sport & Scale as a plan and sets of wing ribs. Very reasonable prices too. We need to patronise those British kit makers that still survive! Percy, KC. You're probably right about Pat's eventual illness, a lesson for all of us. Absolutely right about DB as well of course. Couldn't agree more. All Forum Topics > The 2014 Mass Build > Bi-Stormer contemporary, PFM Team Special 79 60".